Image by brucknerite via FlickrYeah, it's me, the same as ever. You haven't read this wrong. I did it. 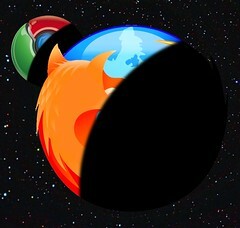 Now I'm a big Firefox fan. I like it so much. But there are some caveats bugging me over a long period of time. And some minor bugs sums up to some annoyances. First of all, I have problems with the "AwesomeBar" when my screensaver or screenlock jumps in, and if I restart my computer from standby in Ubuntu (different version). It disappears. It won't work at all. I have to open the preferences dialog and open the tab for the bar settings. Then it will work as usual. This is so annoying. The bug is known for many month now on launchpad, and nothing has happened. I know this only happens under GNU/Linux. But that's what I'm using. And it doesn't help if everyone blames the other. There has to be a fix. Chrome works, so it should be possible. Resources used by the browser are also a topic. Not so much important, but after 5-6 hours of running Firefox, my Computer is getting slow. I have to quit and restart it (which can take up 18 seconds for Ubuntu to finish the task, so there is a lot of garbage collection going on). I never had this with Chrome. On Chrome not everything is gold. I still don't want to have Apple named in my user-agent. So you can start Chrome with the non-evil User-agent with /google-chrome --user-agent="Mozilla/5.0 (X11; U; Linux i686; en-US; rv:1.9.2.10) Gecko/20100914 Firefox/3.6.10" but expect some websites won't work correctly. You can also do /google-chrome --user-agent="Mozilla/5.0 (compatible; Konqueror/4.5; Linux i686; en-US;) KHTML/4.5.4 (like Gecko)" but you might get rejected by many sites claiming that you don't have a compatible browser. Again, I love Firefox. It's more open and it has a lot of good karma :). But serioulsy, it needs to work. Especially that bug in the "AwesomeBar" is not acceptable after month. I'm trying Firefox 4 when it's finally released. But it better be optimized like crazy, get a diet and get the bugs fixed.